For the renovation of Harrah’s Rincon Café, GPI designed custom Flat-Lite™ LED panels to provide a dramatic standoff backlighting effect for a 3Form© resin feature wall in the main dining room. Working closely with the design, lighting and construction teams, the integrated assembly and standoff locations were detailed precisely to allow for ease of field construction. The translucency of the resin called for a lighting design solution that provided optimum diffusion with minimal hardware. 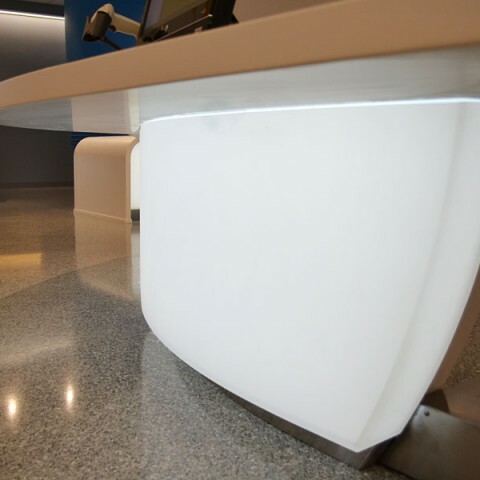 Our thin and lightweight LED light panels were drilled on-site to provide a concealed and functional backlighting solution that was customized to meet the design intent with architectural level details.